My current job involves a lot of spreadsheets and financial data. Like my last few jobs, I’m still mainly building REST API’s, but some of them now use text/csv and Link: headers instead of HAL! Anyway, I had trouble finding a simple CLI-based tool to browser .csv files, and was reminded of an MS-DOS application that my dad used to use on his 386 IBM PS/2: Lotus 1-2-3. Specifically I remember being around 8 years old and just staring over his shoulders when doing spreadsheets. I was just obsessed with anything computer related, or at least that’s what I’m told. In my memory I could specifically remember a cyan CGA-like interface, like you can see in screenshots from this Obituary for Lotus 1-2-3 from The Register. 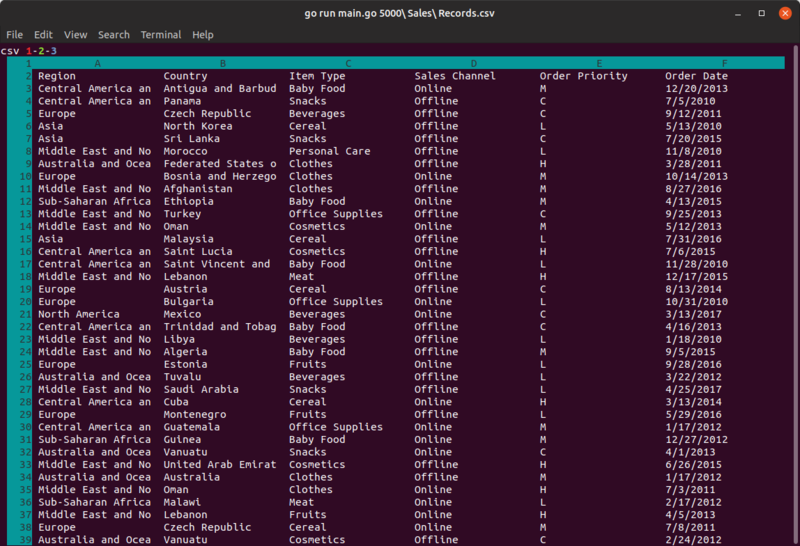 Anyway, I had a day off and decided to make a CLI-based viewer of .csv files in Golang. It’s read-only, and not a 100% faithful replication of Lotus 1-2-3, but it’s homage/nod to both the application and my dad!